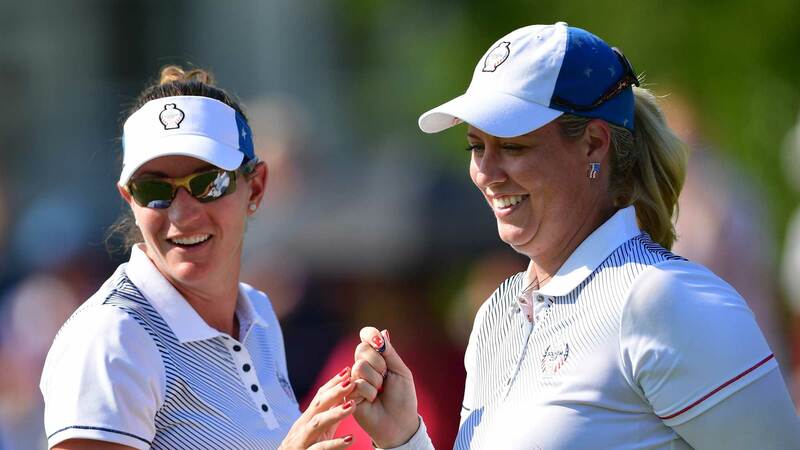 Many of you, who haven't been watching the Solheim Cup, may look at the lopsided score going into today's singles -- 10.5 - 5.5 in favor of the USA -- and think the Euros haven't played very well. It's quite the opposite. This Cup has featured some of the most impressive scoring we've seen in years. Let me give you an example. Let's look at the afternoon fourball between "The Killer Bs," aka Brittanys Lang and Lincicome, and the team of Mel Reid and Carlotta Ciganda. The Brittanys won 2up -- which means the match went to the 18th -- and the lead was never more than 3up. (That was for only one hole. It was often down to 1up.) Doesn't sound very interesting, does it? Lincicome birdied the first seven holes. The seventh didn't count because Lang eagled it. In total, Lincicome birdied ten holes with her own ball, Lang had five birdies and an eagle. For the Euros, Reid had eight birdies with her own ball and Ciganda birdied six. Count those up, folks. In that one match, there were a total of 29 birdies and one eagle! Then, in the Nordqvist/Ewart-Shadoff match -- the only afternoon match the Euros won, and it only went 16 holes -- Nordqvist had eight birdies and Ewart-Shadoff, two. Their opponents, Salas and Yin, posted five and four, respectively. That's 19 birdies in what was probably the lowest scoring match of the day, although the Euros won 4&2. That's a total of 48 birdies and one eagle in JUST TWO of the afternoon matches. It was like that the whole day. The Euros have had a tough time for several reasons. The LET is having a tough time getting tournaments, just as the LPGA did several years back. That means many of the players haven't had the tournament play that the US players have. Then there were the sicknesses and injuries. You know that Suzann Pettersen had to bow out with back problems. And while Catriona Matthew was able to replace her -- and I'm a huge CM fan -- the fact remains that she couldn't be paired with as many different players as Suzann could. Anna Nordqvist is recovering from mononucleosis. She played both rounds on Saturday but it remains to be seen how she'll hold up today. And Charley Hull missed Saturday's matches with a wrist injury she aggravated Friday. She plans to play today but, again, we don't know how she'll do. And then there are the rookies. Personally, I think the Euro rookies have played pretty well, given that most of the rookies play primarily the LET and we know how few tournaments they had to play in. The three US rookies have outscored the four Euro rookies, and I'm not convinced that's the rookies' fault. The odds are against a Euro comeback today. They need to win 9 of the 12 points in order to take the Cup back home with them, and that's going to be a lot harder than the 8.5 points the US needed in Germany. Think about it. How do you get 9 points? And that's it. There is no other way that gets them enough points. But I expect them to put up a magnificent struggle. That's what we've seen from the Euro team so far, and I expect no less today.